To see the Letters to the Editor written in response to this Bully Pulpit that were published in issue 2.1, please click here. 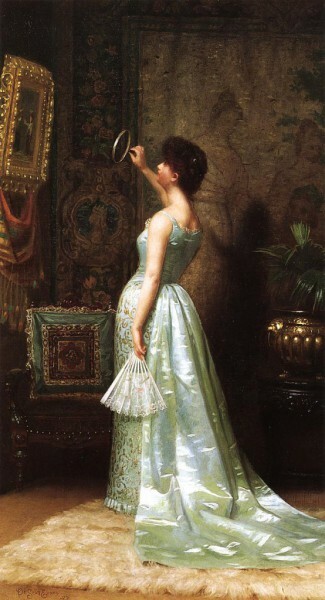 De Scott Evans, The Connoisseur, 1887. Oil on canvas. Image courtesy of The Athanaeum: Interactive Humanities Online, in accordance with Public Domain. The practice of connoisseurship occupies a complicated position within the contemporary realm of art history. In recent decades, the legacy and economic connotations of connoisseurship have clashed with the aims and attitudes of many scholars. To generations steeped in social art history, moved by the urgencies of identity politics, and versed in a post-structural suspicion of “the author,” the connoisseur’s focus on the art object, coupled with his or her reliance on customary notions of authorship and authenticity, have seemed out of date, at best, and beside the point, at worst. Further, as a practice associated with verification and valuation, connoisseurship has smacked too much of the market for those art historians eager to imagine their discipline as a less mercenary field of endeavor. And yet still today, connoisseurship continues in manifold ways to underpin the research conducted by art historians working in academia, museums, and the commercial realm. When researching the work of non-canonical artists, for example, scholars necessarily rely on visual analysis to assemble oeuvres and reconstruct the trajectories of careers that left no other documentary trace: a democratic end served by once-elite means. Other scholars, prompted by an urge to return to the object, have begun to remodel connoisseurship, making new efforts to define its place within the discipline, reimagine its procedures and objectives, and redirect its practice toward a range of object-based inquiries. In this installment of the Bully Pulpit, the editors have invited four colleagues to debate where connoisseurship stands now. We have asked them to consider whether art history without connoisseurship is conceivable or desirable, to contemplate whether the practice of connoisseurship necessarily carries economic implications, and to ponder how, and if, the procedures of connoisseurship might be reconceived or reformed to serve new and perhaps more radical ends in the twenty-first century. What do you think? In Issue 2.1 of Panorama, we will compile the views of you, the readers, in a response section to the Bully Pulpit. This is your opportunity to respond to, argue about, and take positions on this hotly contested issue. So, please formulate your thoughts, send them to journalpanorama@gmail.com with the subject line “Bully Pulpit: Connoisseurship,” and stay tuned! The Bully Pulpit is a regularly recurring section that will pair short scholarly and polemical essays with brief responses from academics, curators, critics, and other interpreters of American art and visual culture. Expanding on the contemporary meanings of the section’s title (and departing from some of its Rooseveltian resonances), we conceive the Bully Pulpit as a unique space for argumentation and investigation, a space where Americanists can jointly discuss pressing problems or difficult questions—be they scholarly, curatorial, pedagogical, or professional in character—of general interest to the field. With this in mind, we invite our readers to submit short scholarly essays, provocation pieces, roundtables, or ideas for future Bully Pulpit sections to: journalpanorama@gmail.com.